ABB is to deliver a marine automation system for a China-built cruise ferry for the first time, after signing an agreement to implement its technology onboard Viking Line’s new LNG vessel. Currently under construction at Xiamen Shipbuilding Industry Co’s yard, the 2,800-passenger cruise ferry will be equipped with the ABB Ability System 800xA. The solution is built on the Microsoft Azure cloud and consolidates power, propulsion and vessel management systems into one platform. This will provide crew and onshore personnel with a comprehensive overview of the newbuild’s operational performance, while the additional marine automation functionality will improve project management and vessel efficiency. Viking Line’s ice-class newbuild will also benefit from ABB’s electrical power generation, distribution systems and bow thruster motors. Plus, she will be the first cruise ferry in the world to feature ABB’s twin XO 2100-type Azipod propulsion units. Last month, Zhenhua 17, a cargo ship from Shanghai drew into the 14th berth of Xiamen Haicang bonded terminal area to drop off equipment for the Xiamen Ocean Gate Container Terminal – the first automated one in the country. All loading and delivery work will be done by machines, so very few workers will be seen at the new terminal, which has been nicknamed the “ghost terminal”, said Wu Xinkui, deputy chief of Haicang district in Xiamen. A video of the terminal in action showed a passing container being picked up by an automated bridge crane and being placed on an automated container truck. Under the instruction of a GPS the truck moved to a designated freight yard before a gantry crane picked up the container again and placed it in a designated area. Officials said that the terminal used an automatic simulation system to make sure that human workers were not needed. Compared to a traditional terminal, the automated version that will become operational in Septermber can save 25 percent in energy and cut carbon emissions by 15 percent, said Wang Shenyuan, general manager of the technology department for the new terminal. Construction of the terminal, which cost 658 million yuan ($107 million), started on Oct 27 last year, and when complete its throughput is expected to reach 78,000 to 91,000 TEU per year, officials said. 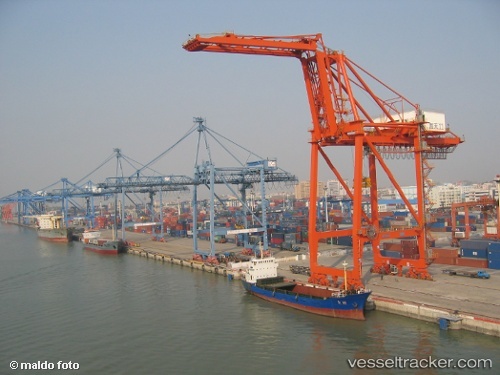 The Haicang bonded terminal area has become a hub for Southeast China’s international shipping industry. So far, the bonded terminal area has a freight throughput of 100 million tons and 10 million TEU of containers. There are 12 berths with a rating of 100,000 tons, which are under construction, and 10 berths with a handling capacity of 50,0000 tons. The Haicang terminal area is China’s most open, functional and convenient bonded area with the most favorable policies, according to officials.